The XMark XM-4432 Power Tower gives you the sturdy frame you need to do your pull-up and dip exercises. 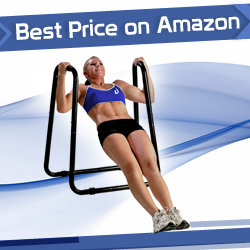 It’s ergonomically designed to put you in the right position for doing each of the exercises. It comes with a pull-up or chin-up station where you can do pull-ups with either a wide or narrow grip. The other side of the tower features a dip station with two dip handles. 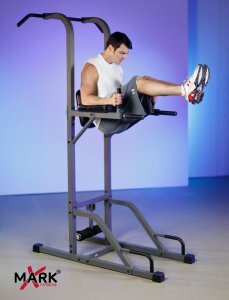 It comes with back and arm padding so you can also do your vertical knee raises here. Down below you can use the push-up and sit-up station to work on your chest and abs as well.